Did you know September is National Gum Care Month? Our gums often take a back seat to our teeth when thinking about oral healthcare. In reality, the health of your gums can have an impact on your overall health and teeth as well. In honor of this month of recognition (and your well-being), it’s a good idea to get educated about the causes and early stages of gum disease in Carrollton. Also, to make sure you know the best ways to take care of your gums. Gum disease is an infection of the tissues that hold your teeth in place. In advanced stages, gum disease can lead to sore and bleeding gums, painful chewing problems, and even tooth loss. The main cause of gum disease is plaque buildup from poor oral hygiene. If plaque isn’t cleaned out through regular brushing and flossing, it will form into tartar which can only be removed by a dentist. Tartar that forms on the gumline will cause your gums to pull away from your teeth, which is why it can lead to bleeding and tooth loss. Smoking/tobacco use: Tobacco use can increase the risk of gum disease as you are constantly inhaling harmful bacteria that can affect your gums. Genetics: Some people are genetically susceptible to gum disease even if they practice perfect oral healthcare. These people should be identified with a genetic test for early intervention to help their mouth later on. Clenching or grinding teeth: This can put excess force on your teeth’s supporting tissues and could speed up the rate of gum disease. Poor nutrition: Because gum disease begins as an infection, not getting the right nutrients can worsen your condition. If you notice any of these symptoms, contact your dentist in Carrollton for their recommended treatment. Floss regularly to remove plaque from in between your teeth. Visit your dentist routinely for checkups and cleanings. If you follow our tips on how to maintain healthy gums, you won’t have to deal with any of the symptoms we have already described. Keeping your gums healthy is important to your oral health no matter what month it is. 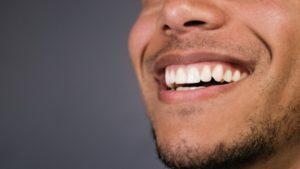 But, since it’s National Gum Care Month, take into consideration the causes of this disease, what to look out for, and how to take care of your gums and teeth so you can always look and feel good in the future. Dr. Rajiv Shekhadiya and Dr. Dhrien Ahir currently practice at Celebration Family Dental where they provide the best care specific to your dental needs. They offer periodontal therapy in their office, which are treatments used to manage and prevent gum disease. For any questions, you can contact them through their website or by phone at (469) 892-6647.